Fall Wreath DIY Project | Sweet . Sassy . and a bit Smart-Assy . I’ve been in a crafty mood lately and with all the holiday festivities coming up I decided I wanted to make something for my home that I could use to decorate for the holidays. After looking up some different projects, I decided on making a Fall wreath. I see them everywhere but they are always so dang expensive and as you know, I hate spending money, especially on things I know I can probably make myself because I would like to think I am a pretty crafty person. PLUS, making it yourself is half the fun! Cute, right? Of course, this happened to be one that didn’t come with a how to or what supplies to get….So with this picture in hand, I made my way to Hobby Lobby for some craft supplies. I found all kinds of goodies here. Of course I bought all the fall stuff because it was 40% off and then I never go in without a 40% off coupon that you can use on full priced items so I was able to get the wooden cross. I bought brown, orange, and white paints, a package of scrap pieces of wood, burlap scrapbook paper, plastic pumpkins, fake fall leaves, and leather jewelry string. I went back another time and got a glue gun to use my 40% off coupon, and went back another time to get decorative ribbon, again with the coupon. (Hobby Lobby is right by my Crossfit so I stop by on my way to work out and when I’m leaving so I can get more stuff for cheaper by using two coupons a day…judge away but I save lots of money this way! Crafts are expensive!) I was able to find the brown and orange glitter glue at Jo-Ann Fabric. Mom went to Canton so I had her search for some supplies as well because I knew they had a bunch of mesh wreath decorating supplies there. She was able to find me the base and a roll of skinnier bronze glitter mesh. Now I was good to go! 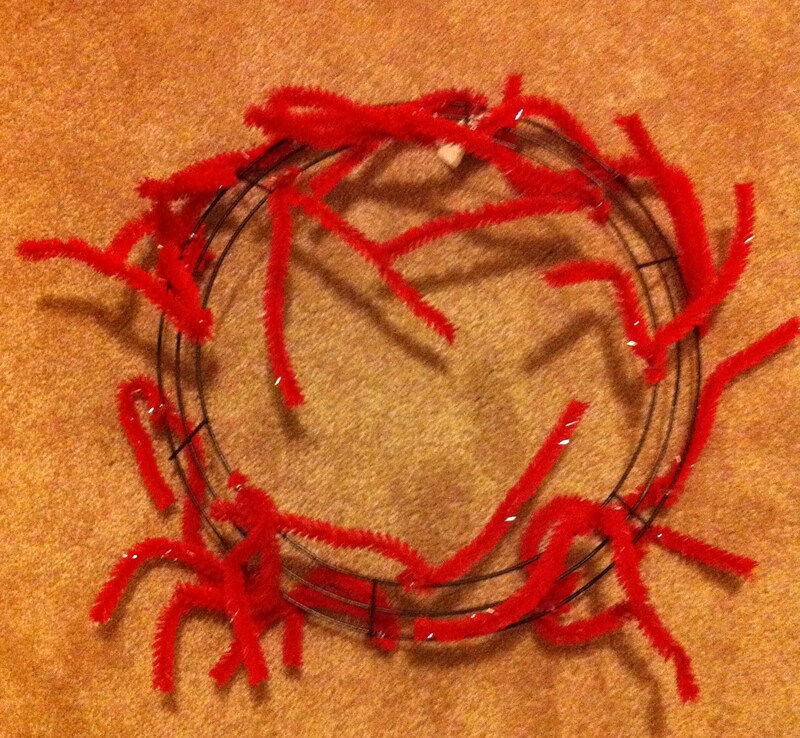 If you’ve never made a mesh wreath, I will teach you by walking you through what I did. 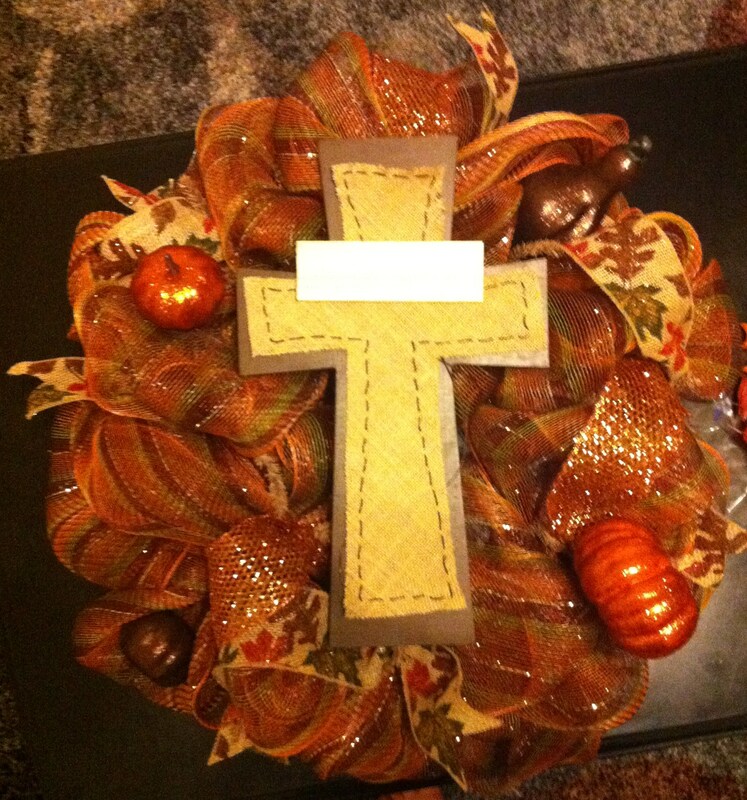 Most of my stuff was trial and error because this was my first attempt at making a mesh wreath as well. I’m sure there are easier ways of doing some of these things but it was all I could think of at the time. If you are a mesh wreath-maker, please feel free to give me pointers! Although, this was relatively easy, just time-consuming. Step 1: Wrap the mesh on your wire base. The bases that Mom got me in Canton were basically 3 connected wire rings of different sizes with thick pipe cleaners attached at random spots, spaced out. I had my roll of mesh and this base and was like, “Umm…what the heck do I do now?” So I did what anyone that is trying to learn how to do something would do. I looked up a how-to video on YouTube. This is the video I used to learn and it was Easy Peasy! As you can hopefully tell, I added 3 “bubbles” of a bronze-colored deco mesh (top, bottom-left, and bottom-right). I didn’t want to put it all over the wreath like she did in the video so I cut decent length strands and just attached them between two pipe cleaners to make that bubble look. 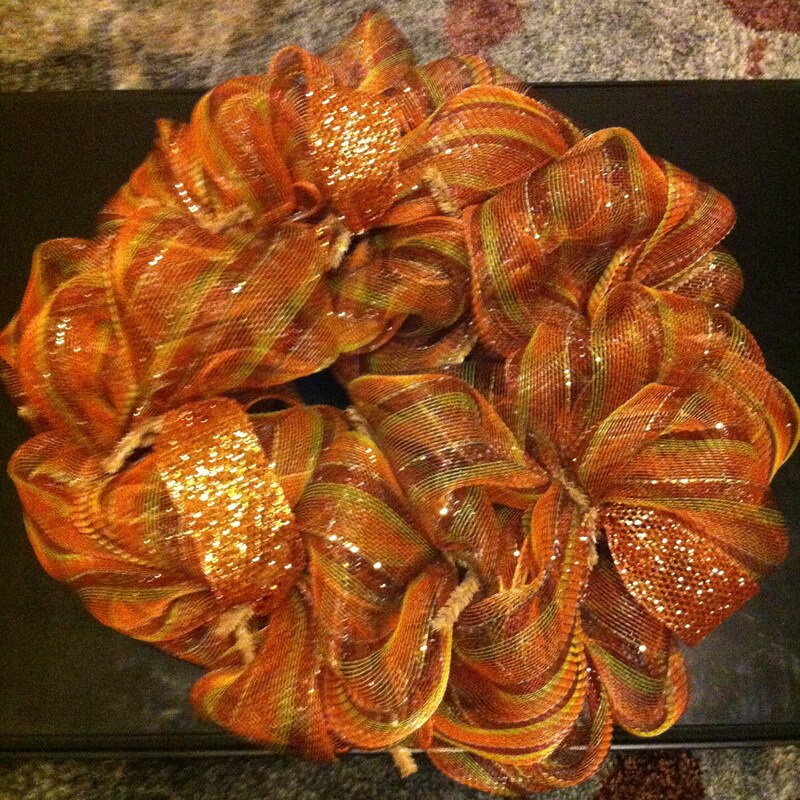 I couldn’t find the green, tan, and orange ribbon like in the picture so I substituted that with a burlap-ish wired ribbon with green, brown, and orange leaves all over it. For this accent I cut longer pieces, V’d the edges so they weren’t just boring straight edges, and looped them between two pipe cleaners. Because these were longer, that left room for little pieces to be hanging out so you could see the V-shape I made at the ends. Some of these I weaved under the other mesh and some I just put on top of everything else. You just need to try them both and see what looks best in that particular area of the wreath. I don’t have a picture of this step but what I did was paint the cross brown. Then, I cut a piece of the burlap scrapbook paper in the same shape as my cross but a little smaller so the brown wood could be seen behind the paper. After cutting the burlap, I took a strand of the leather jewelry string and hand-wove it through the tiny holes. This was probably the most time-consuming part of the whole wreath. I didn’t attach the burlap to the cross yet and you’ll see why in step 5. The plastic pumpkins came in orange and greenish-yellow. I left two of the orange pumpkins exactly how they were but just painted them with orange glitter glue (using a paint brush just like it was paint rather than glue). For the greenish-yellow gourd-ish pumpkin and the other little pumpkin, I painted them with regular brown paint, let that dry, then painted them with brown glitter glue. I positioned the cross in the middle. Once I found the angle that I liked (I tried it with the wreath in every direction to pick the “top” side), I took more of the leather jewelry string (you know, the kind I used to “sew” into the burlap) and wrapped it around the underside of the horizontal part of the cross one time, hot glued it in place, then tied the ends VERY tightly to the wire wreath base. Then I did the same thing right above the horizontal part of the cross. Once I knew the cross was secure (tested via shaking the wreath and making sure nothing fell off), I mod podged the burlap onto the painted cross. This was messy because the mod podge seeped through the burlap but it dries clear so it was perfect. The pumpkins came on little sticks so I left them on thinking I could shove them into the mesh then hot glue them in place…so that’s exactly what I did. 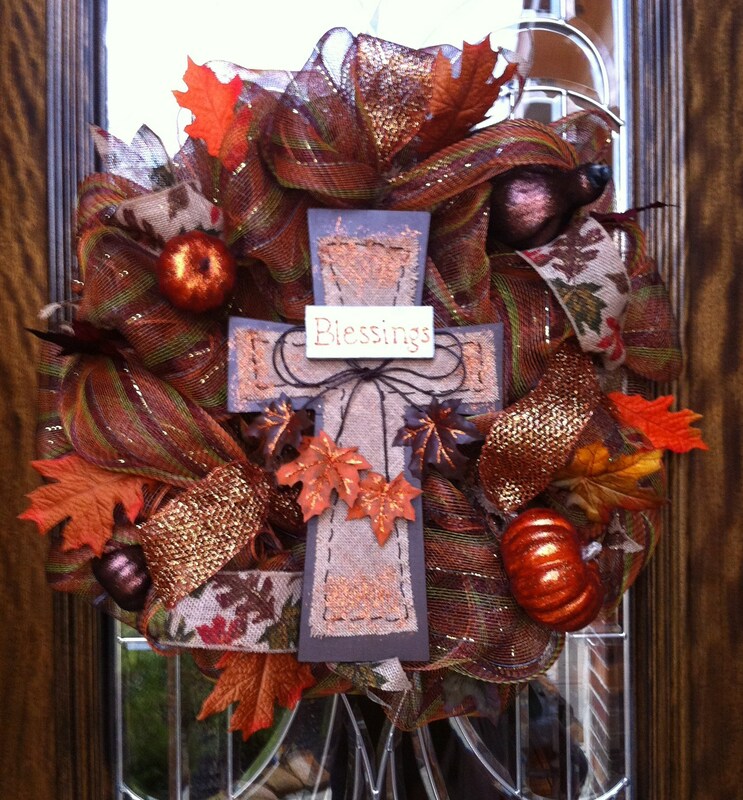 I found places on the wreath that I liked for the pumpkins, shoved the sticks into the mesh, and hot glued them. For the four leaves in the middle, I took leaves from the package I bought and painted two brown and two orange. Once that dried, I drew over the veins with the orange glitter glue to make them stand out more. I cut the strings of the bow (there are four of them remember since it was a double bow) to different lengths and hot glued one leaf to each of them. Next I wrote “Blessings” on the strip of wood that I cut and painted white (in step 4) using the orange glitter glue. I attached this strip to the cross with hot glue. Almost done! 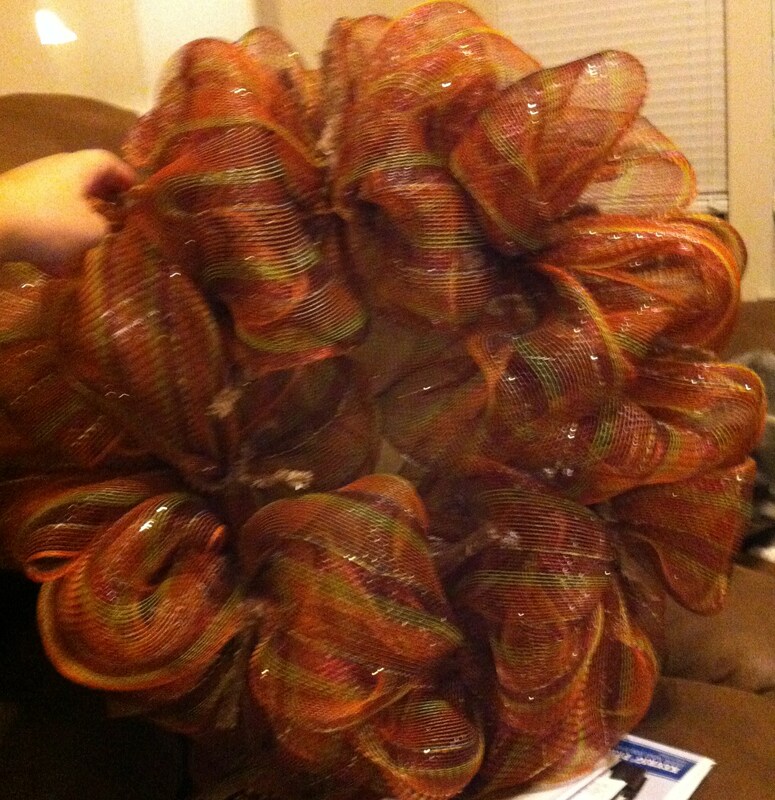 The next part was to add leaves all over the wreath, throughout the mesh. I stuck the leaves in random spots and moved them around until I liked how they looked then hot glued them in place. The last little detail was just painting glitter on all four ends of the cross to give it a little more color and make it POP just a little more. Then…VIOLA! 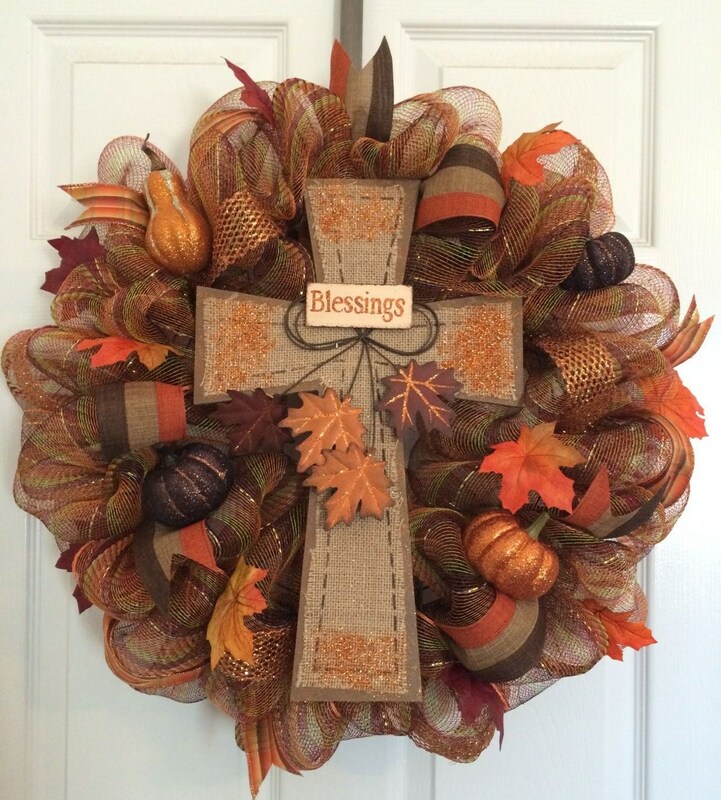 You have yourself one fancy Fall wreath! 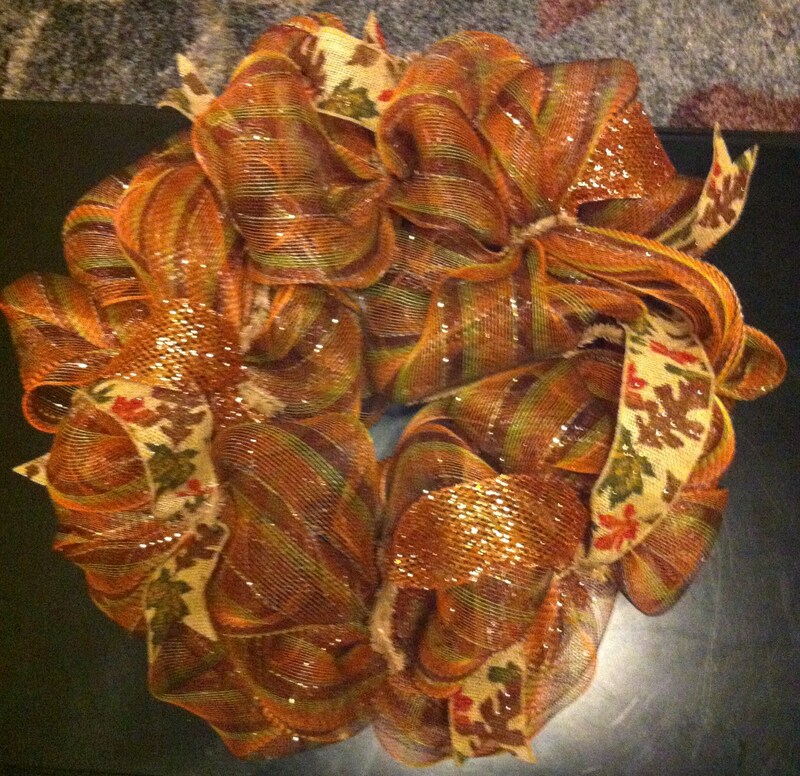 My Wreath – Final Product! It was really hard for me to get a good picture of this thing…the glare on my front porch is horrible so that is the best one I could get. You can see the details much better in person. So what do you think? Close enough to the one I saw on Pinterest? BTW, I just hung it up using a 5-lb capacity Command Hook instead of one of those bulky wreath hangers. So far, it has worked like a charm! I had so much fun making this wreath! It was just the right amount of craftiness that I needed in my life lately! Now I am ready to make a Christmas one! 🙂 Who wants to join me?? I am in for Christmas decorating. I think we need a wreath/ornament decorating party! Kooken has a great idea. Don’t forget to invite me ! !